So, with the arrival of spring, I've been thinking more about getting into better shape. I still have the perpetual 8-10 lbs I'd like to lose to get to my ideal weight. But more importantly, I do want to just generally improve my physical fitness. I eat pretty well, and I'm fairly active, but I've slacked off really exercising in depth. I walk and dance weekly, but runs have been pretty sparse in recent months, and strength training downright unheard of. I feel a bit out of shape, and I'd like to remedy that, and drop a few unwanted pounds in the process. So, now what? Sigh. I work full-time outside the home plus I have a small child, so time is at a premium. I'm not a gym person (don't have the money, or the inclination). I've been trying to renew my power walking at work during my lunch hour, which is when it's easiest for me to exercise. I also dragged my hand weights back out in the hopes of getting that in 2-3 times per week at home. I'm going to try that tonight, with Hank. We'll see how that goes. I hope we don't break anything. I'm going to try and report in weekly on my progress, perhaps this will motivate me. I won't be saying what I actually weigh, not that it's atrocious or anything, I'm just way too vain for that. I can admit that openly :) All I'll say is that I have an average build and I've never been a size 0, nor will I ever see two 1's put together in my weight ever in my life. And I never will. I think my *bones* weigh more than that. We'll use my secret weight from yesterday as my starting point. *makes mental note* As of this morning, I've lost 2 ounces. Ugh. We'll get there. By the end of the summer I'd like to be at my ideal weight. I think that's reasonable. It's about 8 lbs. away. In terms of spirituality, I've been trying to pray more. God is always in my thoughts, but I wasn't actively praying as much as I should. I've renewed my efforts in my morning offering, my daily rosary (at least 2 decades), spontaneous prayer throughout the day, and evening devotional time with my Bible. I've been wanting a small purse-sized New Testament so that I could have that for anytime I wanted or needed the scriptures. Yesterday, on my way home from work I stopped off at the local Christian bookstore to peruse. They had lots of small New Testaments, but only 1 of the Catholic variety, the St. Joseph New American Bible, Vest Pocket Edition. It was exactly what I wanted, though a few dollars more than I'd planned on spending. It has a leather cover, instead of the paperback I was expecting. I ended up getting it, figuring the sturdier cover was better for getting stuffed in my purse anyway, and it's working out well. I already used it this morning when I arrived at work. In other devotional news, my fellow (and favorite!) 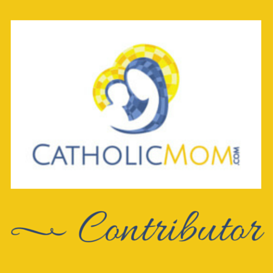 Catholic blogger Cam is having a rosary giveaway in honor of her new etsy store over at her blog. Enter A Woman's Place... rosary giveaway by leaving a comment, and/or check out her etsy store, Full of Grace Creations! She has some beautiful rosaries and rosary bracelets for sale.